How it works Give it a go! Now you're over the age of 55 you can withdraw from your pension directly. This process is called drawdown. In the next step you will be able to start the withdrawal process. You can take as much or as little as you like. Up to 25% of your pot can be taken tax-free, with any withdrawal over this amount subject to income tax. If you want to access your taxable cash, you will first need to take cash from your tax-free amount. The more you take, the more taxable cash becomes available. We charge a fee of £400 + VAT if you withdraw your entire pot with 12 months of joining PensionBee. You will pay income tax on anything above the 25% tax-free amount. The amount you pay depends on your total income for the year and your tax rate. We will always apply an emergency tax code, and you should settle any remaining underpaid or overpaid tax directly with HMRC. Can I still contribute after I start withdrawing? Yes, but once you take cash above your 25% tax-free allowance you'll then become subject to the Money Purchase Annual Allowance of £4,000. This means that you can only contribute £4,000 per year, instead of £40,000. Remember, excessive withdrawals can reduce your retirement income significantly. If you'd like to know more about pension withdrawals, visit our Pensions Explained Centre, or watch our simple video summary. I understand – let's go! How much would you like to withdraw? This is the balance of your PensionBee pension. You can take as much or as little as you like. This is your total tax-free cash available. Use the box below to enter how much tax-free cash you want to take, or tick to take the full amount. The amount of tax you pay is calculated under PAYE, based on your taxable earnings within the current tax year. We charge a fee of £400 + VAT if you withdraw your entire pot with 12 months of joining PensionBee. As the value of your pension changes daily, these calculations are illustrative and actual values may differ slightly. In the next step you will be able to start the drawdown process. You can take as much or as little as you like, and up to 25% can be taken tax-free. 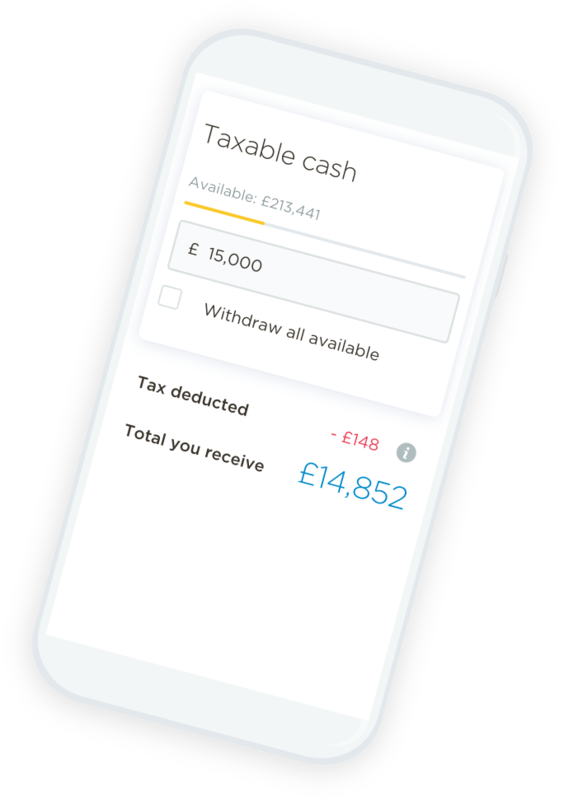 To access your taxable cash you'll first need to take some tax-free cash – what's available depends on the amount of tax-free cash you withdraw. Can I still contribute in drawdown? Yes, but once you take cash above your 25% tax-free allowance you'll then become subject to the Money Purchase Annual Allowance of £4,000. This means that you can only contribute £4,000 per year. Remember, excessive withdrawals can reduce your retirement income significantly. Click here for a simple video summary of how drawdown works. Please answer the following questions. If you need any help, just contact your BeeKeeper. Have you registered with HMRC for protection against reductions in the lifetime allowance? Usually only applies to people with pension savings over £1 million. Have you made a withdrawal from another pension provider? This only applies if you have already withdrawn pension savings from another provider. We need to know this for tax purposes, so please fill out a separate field for each withdrawal you have made. How much of your lifetime allowance have you used? Please list each withdrawal separately. Note this may impact the amount you are able to withdraw – we will confirm this once you have submitted your request. Have you spoken to a regulated financial adviser? You should speak to Pension Wise or a regulated financial adviser before you make a withdrawal from your pension. You can book a free appointment with Pension Wise here. Have you spoken to Pension Wise? Before benefits are withdrawn from your PensionBee Personal Pension, we strongly suggest that you take either guidance from Pension Wise or financial advice from an FCA-regulated financial adviser. Please note PensionBee does not provide financial advice, only guidance. Are you aware of the income tax implications of the option you have chosen? You can withdraw up to 25% of your pension without paying tax. If you withdraw more than this, you'll pay tax on your withdrawals at an emergency tax rate. Depending on the amount of income from this and other sources, this could push you into a higher tax bracket. If you invest money from your pension in another saving product, you may have to pay income tax on your returns. You should check your tax return as you may be able to reclaim some tax. Are you aware of the inheritance tax implications of the option you have chosen? If you pass away under the age of 75, your beneficiaries will inherit your pension tax-free. If you're over 75, your beneficiaries will have to pay tax at their marginal rate of income tax on any pension that you leave them. But if you withdraw money from your pension and invest it elsewhere or leave it in your bank account, this money will be included as part of your estate, and your beneficiaries may have to pay inheritance tax. Are you aware of the capital gains tax implications of the option you have chosen? Funds held within your pension scheme are not subject to capital gains tax. Once you've withdrawn money from your pension, any capital gains that are made will be subject to capital gains tax rules. Are you expecting your pension withdrawals to maintain your lifestyle throughout your retirement? Your pension is supposed to provide you with an income during your retirement, and this may mean that it needs to support you for many years. When you're deciding how much money to withdraw and which pension product to buy, you should think carefully about how much you need to live off during retirement and seek advice if necessary. Are you aware of the effect your pension withdrawals may have on any means-tested benefits you receive? While money is in your pension scheme, it isn't usually included in any means-tested benefit calculations. When you withdraw money from your pension, it will usually be taken into account when your entitlement to means-tested benefits (like housing benefit or income support) is calculated. If you currently receive any of these benefits, you may want to calculate how they will be affected before you take money from your pension. Are you aware that in the event of your insolvency, your creditor will have a claim over the funds you withdraw? While your money remains in your pension, it's usually protected from your creditors if you become insolvent or bankrupt. Once funds have been withdrawn, your creditors may be able to claim them if you're declared bankrupt. This is a complex area, so if you're concerned about bankruptcy, consider seeking legal and financial advice. Do you intend to pay future contributions in excess of £4,000 a year into your pension? If you take a taxable payment from your pension then your annual limit for making tax relievable contributions to your pension is reduced to £4,000. This is known as the Money Purchase Annual Allowance. If you contribute more than £4,000 into your pension in a single year, you will face a tax charge. Are you aware that other pension products are available to pay your pension income? There are many different pension options and products available to you which may suit your needs. Are you withdrawing funds from your pension to invest elsewhere? If you are investing your money, you should be aware of any relevant implications. Are you aware of the tax treatment of these investments? You should make sure you are aware of all the tax considerations involved before deciding to proceed. Are you aware of the fees and charges for these investments? You should make sure you are aware of all the costs involved before deciding to proceed. Some costs may not be immediately obvious. Are you aware that investment scams exist and that you should be careful where you invest any money you withdraw? It's important to be wary of investment scams. Scammers may promise you impossibly high returns on your investment, or tell you that you can access more than 25% of your pension tax-free. Scammers will often cold call you or send unsolicited emails and texts. Always check that the company you're speaking to is regulated and authorised by the Financial Conduct Authority (FCA) by checking the FCA website. Which bank account would you like this money paid into? We've received your request to withdraw money from your PensionBee pension, and verified your identity. You can find the details of your withdrawal below. Whoops! Sorry, there seems to be a problem. Please reload the page so we can try that again. Contact us through live chat below if that does not help. This should only take a few seconds. The details of the withdrawal you've requested are below. Unfortunately we can't complete your withdrawal until we verify your details. Please go to Verify my details and follow instructions there. The details of the withdrawal you've requested are below. You currently have a pending withdrawal – details below. You can request another withdrawal once this has cleared. We verify your ID and bank account*. Normally within 1-3 days of receiving your withdrawal request. We withdraw your investment. This typically takes around 6 working days. When your funds are received and whether you're taking tax-free or taxable income will impact when the payment can be processed. When your funds are available, we will send the money to your designated UK bank account via Faster Payment. This step can take from 1-6 working days. *If there are any issues with either verification, your BeeKeeper will be in contact. Please be aware that this can add additional days to the timescale noted above. You can take as much or as little as you like. Up to 25% of your pension can be taken tax-free, as a lump sum or in portions. The more tax-free cash you take, the more taxable cash that will become available. We will always apply an emergency tax code on a withdrawal, and you should settle any remaining underpaid or overpaid tax directly with HMRC. To discover more about tax rates and how they can impact on your withdrawal, watch our video explainer on drawdown tax. How does the drawdown calculator work? Enter your pension balance. We can only calculate for pensions that have not yet been accessed, so please bear this in mind when entering your balance. Check the tax-free cash available. Under current legislation you can take up to 25% of your pension tax-free, as a lump sum or in portions. Tell us how much tax-free and taxable cash you would like to take. What tax rate does the drawdown calculator apply? We will always apply an emergency tax rate on withdrawals, so please bear this in mind before you start planning drawdown with PensionBee. It’s likely that you’ll overpay tax, and in this instance you should contact HMRC directly to claim your money back. You might also underpay, and in this case HMRC will adjust your tax code or contact you to make up the difference. To discover more about tax rates and how they can impact on your withdrawal, watch our video explainer on drawdown tax. We have assumed you have not started accessing your pension yet and are over the age of 55. In accordance with HMRC guidelines we apply an emergency ‘Month 1’ tax code. This means you only get one twelfth of the available tax allowances, which may result in you being overtaxed or undertaxed in this illustration. We have assumed that you are not subject to our early withdrawal fee of £480, which applies when your pot has been with PensionBee for less than a year and you wish to withdraw it in full. What are the risks of drawdown? Drawdown comes with a number of pros and cons, and it isn’t the right option for everyone. Watch our video explainer to see whether it’s the right choice for you. Consolidate your pension pots into one new online plan and start withdrawing your pension from the age of 55.